These two X-Men have been both the closest of allies and the fiercest of rivals throughout the history of the Marvel Universe, but today we find the two locked in mortal combat. The two heroes have been at odds of late following the events of “Schism” and “Avengers vs. X-Men,” and now Cyclops and Wolverine are ready to settle their differences once and for all. Born in the late 19th century, James Howlett had a traumatic childhood that involved more than one incident of claw-related manslaughter. He abandoned civilization for a time to live with a pack of wolves, before eventually returning to his home country of Canada to join the military during World War I. This would be the true start of Wolverine’s career as a killer, which would continue through the Second World War and his time working for Weapon X, a shadowy government organization that gave him false memories and bonded the unbreakable metal adamantium to his skeleton. Even to this day, Wolverine continues his violent brand of vigilantism on multiple superhero teams, including the Avengers as well as the X-Men. In addition to his adamantium-coated skeleton and claws, Wolverine also possess an accelerated healing factor and keen animal senses. Furthermore, Wolverine is a master of dozens of forms of armed and unarmed combat. While Wolverine is functionally immortal, he does have certain weaknesses; the enchanted Muramasa Blade and the metal carbonadium both pose a danger to Wolverine, as does the possibility of decapitation (which is extremely unlikely due to the bonding of adamantium to his spine). When Scott Summers and his brother Alex were taken on a family flight by their parents one cold Alaskan morning, they knew nothing of the lifetime of hardship that this fateful trip would entail. Midflight, the Summers family was attacked by a Shi’ar spaceship, and the Summers parents gave the lone parachute onboard to their sons so that they might survive. With their parents seemingly killed, Scott and Alex were sent to separate foster families. Shortly thereafter, Scott’s mutant powers activated and he was taken in by Professor Xavier to become one of the first X-Men. Cyclops has the ability to project extremely powerful beams of concussive force from his eyes, which are portals that draw that energy from an alternate dimension. In addition to this power, Cyclops also possess enhanced spatial awareness, allowing him to perform skillful trick shots as well as aiding his piloting and martial arts abilities. Cyclops has almost never been in full control of his power, and after his recent possession by the Phoenix Force, he optic blasts have become wildly unpredictable. During the events of “Schism” the young Black King of the Hellfire Club orchestrates a series of attacks that separate and incapacitate most of the X-Men. During one of the Hellfire Club’s attacks, the just-opened Museum of Mutant History was assaulted, leaving all those within except teenage mutant Oya disabled. 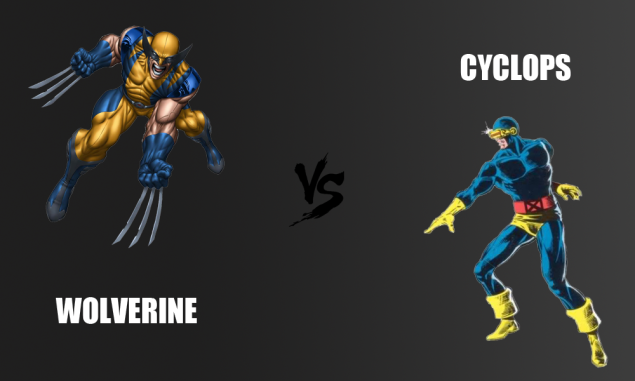 Both Cyclops and Wolverine were in telepathic contact with her at the time, and while Wolverine coaxed her to flee, Cyclops told her to fight. She ended up killing the Hellfire soldiers present, which began an ideological split between Cyclops and Wolverine. Later, the Hellfire Club sent a massive Sentinel robot to attack the mutant island nation of Utopia, which had been left practically unguarded as the X-Men had been deployed around the world to deal with other Sentinel attacks. Again, Cyclops wanted the adolescent mutants present to fight, and Wolverine did not. Unable to reconcile with one another, the two came to blows in a close battle, but were forced to reteam to take down the Sentinel threat. Once that issue was settled, Wolverine decided to leave Utopia to restart a mutant school in Westchester, with many other X-Men joining him. Can the once and future leader of the X-Men put down the rabid Weapon X? YOU can vote below to decide who wins?